A zygote is the cell formed when two gametes fuse during fertilization. The DNA material from the two cells is combined in the resulting zygote. The cellular mechanisms present in the gametes also function in the zygote, but the newly fused DNA produces a different effect in the new cell. In single-celled organisms, the zygote becomes a fully functioning organism, and can divide through mitosis to produce offspring. The organism can also produce gametes to reproduce sexually with other cells. Multicellular organisms use a similar process, producing gametes that fuse during fertilization to produce a zygote. The zygote then undergoes many round of mitosis to produce an entire organism. Depending on the size of the organism at birth, the development time of the young can vary. The African elephant, for instance, has a gestation time of over 20 months, or over a year and a half. Some rodents, on the other hand, only need two weeks or so before babies can be born. It all depends on how many cells are needed in the final organism, and how developed the organism is at birth. In most animals, the gamete cells are converted to haploid cells before reproduction, in a process known as meiosis. By reducing the number of alleles in each gene to 1, a zygote formed by two haploid gametes will have the proper number of alleles. This is important in most animals, as the wrong number of chromosomes or alleles can produce negative effects. The well-known genetic defect Down Syndrome is caused by an extra 21st chromosome in humans. In most vertebrates besides fish, extra copies of alleles are usually detrimental. In plants, the condition of more than two alleles in a zygote is not always detrimental. Often, plants have many copies of a gene with different alleles. Many plants do not undergo meiosis before reproducing by accident, and therefore are prone to accumulating many copies of a chromosomes as generations continue to reproduce. The zygote that forms from accidental gametes can create a novel varieties of plants. Many commercial agricultural crops are the results of polyploidy affecting the plant in some way, either making them bigger or making their fruits sterile so people cannot grow them and must buy more. 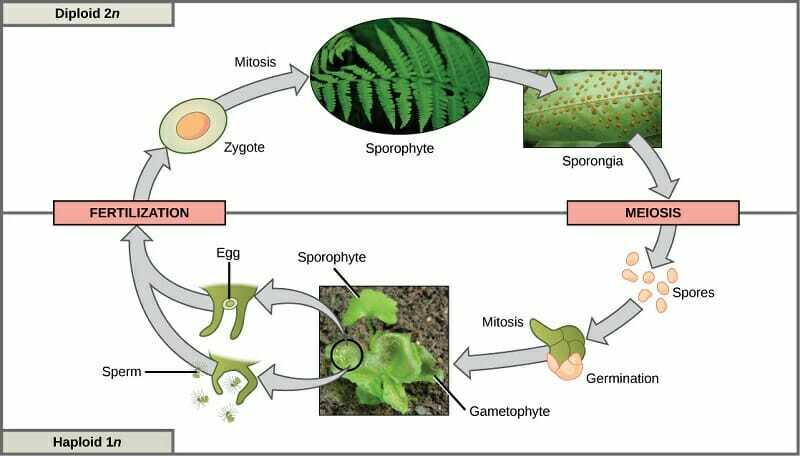 Besides these differences in plants, a zygote is still formed when two gametes fuse. 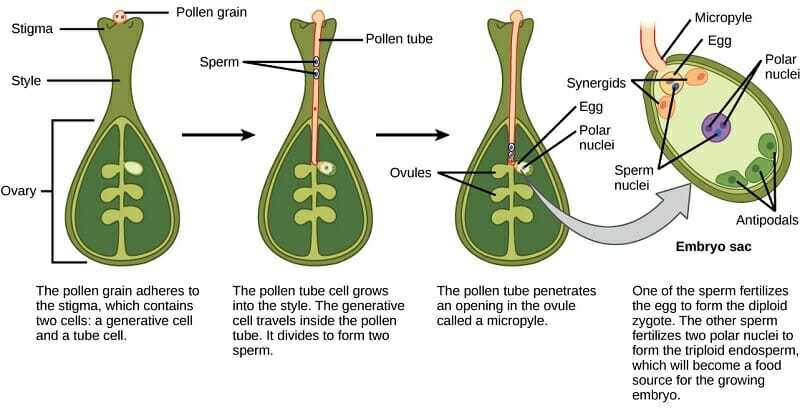 In many higher plants, the zygote forms when the pollen fertilizes an egg inside of ovules in the flower. The process is detailed in the following image. In fungi, the process of forming a zygote is a little different, because fungi have somewhat different lifecycles. Many fungi are haploid the majority of the time. Sometimes haploid cells combine through a process of karyogamy, or combining of nuclei. This produces a diploid organism for a short time. During this time, important genetic variation and recombination can take place, allowing fungi to remain adaptive in the face of adversity. Who doesn’t love a puppy? The process of creating a puppy starts by creating gametes. In both the male and female, the process of meiosis reduces the number of alleles in each cell to 1 instead of 2. Once the gametes are made, the animals must mate. The male dog’s sperm make their way to the female’s eggs as they travel from her fallopian tubes to her uterus. Once an egg and sperm meet, fertilization occurs. During fertilization, the sperm combines DNA with the egg, producing one cell. This single cell is now known as the zygote. The zygote will divide through mitosis. Eventually, the cells will start to specialize and continue dividing. In time they will create a litter of puppies, which the female will birth. The puppies are still not fully developed, and take several weeks to open their ears and eyes fully. Ferns, and other plants, feature an interesting life cycle known as the alternation of generations. A fern plant in the diploid stage is known as the sporophyte. The sporophyte has special structures on the undersides of the fronds, or leaves, that produce spores. These sporangia produce haploid spore. This may seem similar so far to sexual reproduction seen in animals. However, the spore is not a gamete. Instead of making gamete directly, the spore gives rise to a new, much smaller plant when it lands in a suitable place. The small plant, called a gametophyte, produces both male and female gametes. The gametophyte even has special structures to produce the eggs and sperm. Once an egg and sperm meet, either from the same gametophyte or from different gametophytes, a zygote is formed. The zygote then finds a suitable place, divides through mitosis, and gives rise to a new fern, for the process to begin again. Below is a picture of the cycle for reference. Human zygotes are formed in the same way as dog zygotes. Egg meets sperm, fertilization occurs, and a zygote is formed. Unlike dog zygotes, human zygotes have been a huge source of contention in modern politics. Past and current legislation aims to accurately define a “human life” to determine whether or not abortion should be legal. Critics of legal abortion claim that a zygote, unlike eggs and sperm, has the potential to become a unique person. Supporters of legal abortion claim that birth, and therefore experience, is what makes a person a person. Others argue it is when the heart starts beating, or when the neurons start firing. Whichever side you stand on, it is important to know the process of development, what a zygote is, and why zygotes are so important. Gametes – Cells made by sexually reproducing organisms intended to fuse into a zygote. Meiosis – The complex process by which diploid cells are reduced to haploid cells, in preparation for fertilization. Mitosis – Normal cellular division, in which an identical copy of the DNA is created and no change in ploidy occurs. Polyploidy – A condition arising when meiosis fails or does not take place, resulting in more than two copies of the genome. 1. Aliens, from the planet Dosnaut Xcyst II, reproduce in a peculiar manner. A large, immobile, and haploid individual starts the process by fusing gametes from itself and other haploid individuals together to create single diploid cells. It then sprays these cells into the air, and they are carried adrift. These cells mature, multiply, and become small flying animals. These animals can travel long distances before they undergo meiosis and lay 2 eggs, each becoming a new haploid individual. Which individual would we say creates the zygote? C. Neither of them, there is no zygote. A is correct. When the haploid individual fuses two gametes together, a zygote is formed. Even across the various life cycles on earth, whenever two gametes meet and fuse, a zygote is formed. Sometimes these gametes are haploid and sometimes diploid, depending on the species and life cycle. 2. Fertilized sea-turtle eggs, before they start developing, are made of a single cell. What is this cell? B is correct. The fertilized egg of any animal represents the combination of two gametes. Any time two gametes combine, a zygote is formed. A spore can be many things, depending on the species. A gamete is a cell used in sexual reproduction. In this case, an unfertilized turtle egg represents a gamete. 3. Bacteria produce exclusively asexually, although sometimes they can transfer genes between individuals in a population. When a bacteria reproduces, it copies its DNA and divides in two. Do bacteria have a zygote? B is correct. Bacteria do not form a zygote because they do not reproduce sexually. Even when bacteria transfer segments of DNA, the cells do not come together. Rather, the DNA is leaked through the membrane of the bacteria and is expressed by the cell’s machinery. Because no gametes fuse together, no zygote is created.